Denny Dennis was still of course an apprentice and there was a great deal to be learnt about the craft of singing professionally. Denny continued to study the techniques and styles of the time, and there was probably no finer place to learn than that of the dance bands. This was the ‘Golden Age’ where standards of musicianship were paramount. There was no masking of ability here. Since arriving in Britain in 1930, American band leader Roy Fox had established one of the very finest dance bands of the time. 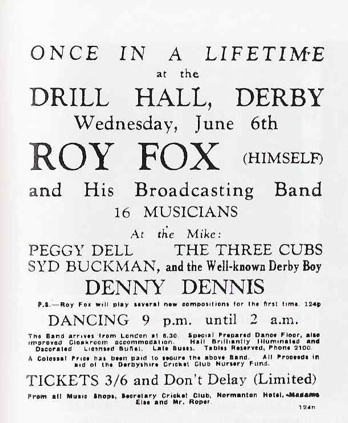 Highly disciplined, highly musical, and with wonderful arrangements, the Roy Fox band was one of 'The' places to be for an aspiring vocalist. Denny Dennis had more than arrived. He had made it to the big time. The age of the popular singer however was still a long way off and in those days it was the dance bands that were the stars. The singers of the period were often not mentioned on the record labels at all, but merely referred to within the standard phrase, ‘With Vocal Refrain’. But via radio broadcasts the vocalists became well known to the public, and Denny’s name gradually became associated with vocals of the highest standard, and he became more popular. As part of his acceptance the young and naive Denny took more than a gentle ribbing from the sometimes boisterous and high-spirited musicians in the Fox Band. One time, Denny found his newly cleaned and pressed tuxedo full of fish, and having no other, masked the smell with perfume and after-shave. He later hung the tux out of his hotel window to air, but it rained during the night. When things became so bad, Fox stepped in and demanded that it stop, informing everyone that no one in the band was more important than Denny. Life with the band was a hectic round of broadcasts and recordings. The one thing that Denny came to dislike about his chosen profession was the constant touring and living out of a suitcase. But that was part of the course. 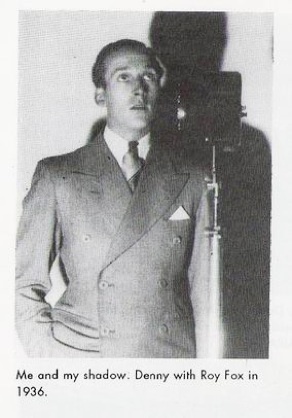 Denny could also be a little nervous when appearing before audiences, preferring instead the anonymity of the recording studio. Most often, the nervousness did not show through. “I had started to become more relaxed and I had eliminated a tendency to over-enunciate. A relaxed, easy laid-back style is a lot harder to achieve than you might think. To my mind, this was exactly how I wanted to sound and there is a marked difference in the recordings that I made at the start of my career and the ones I was doing in 1936”. Denny’s time with Fox was successful. The many fine recordings, the growth of his talent and confidence, plus a very nice salary by the standards of the day, allowed Denny a lifestyle that he would have been unlikely to have enjoyed outside of the entertainment business. But Denny was also thinking beyond the Fox band and privately worked towards the possibility of a solo career. In 1935 he made the first of his many solo recordings with, ‘The Image Of You’ and ‘Once Upon A Midnight’. "Denny Dennis by this time was getting more and more popular with audiences and his voice had improved greatly. I think he was starting to forget that he had been an electrician and was now rapidly becoming aware of the possibility that he might one day be top vocalist in Britain, which of course, he was. I'm sure it would have surprised him to know that one day he would be singing with the great Tommy Dorsey band in the States." Roy Fox however, should also take some of the credit for Denny's success. It was Fox who heard something in Denny's voice, and it was Fox who took a risk by taking him on. 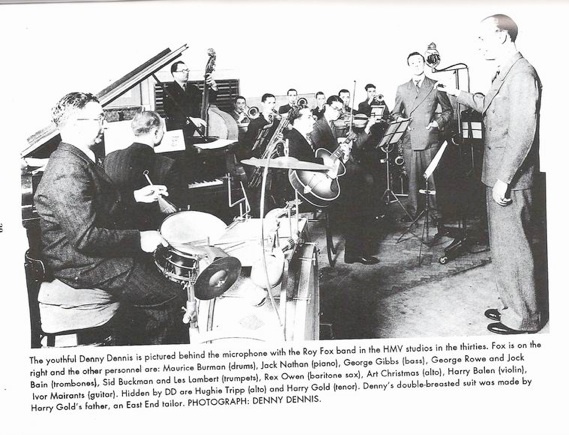 It was within the very musical and disciplined Fox band that Denny's talent was nurtured and where it matured. Many more fine recordings were to come with the Roy Fox band. By late 1937 however, the Fox Band was experiencing some difficulties. In December 1938 it finally disbanded. By This time, Denny was ready to leave and strike out on his own. He was well known, and highly regarded. But it was not quite time for a successful solo career. Eventually, he was persuaded to join another top class and successful band, that of Bert Ambrose.